AP Postal Recruitment 2017: Andhra Pradesh Postal Department Released the AP Post Office Recruitment 2018 Notification. 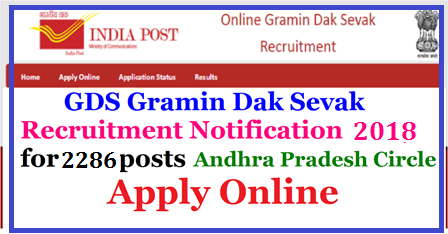 The AP Postal Jobs 2017 Notification is to fill up the 190 Gramin Dak Sevak Posts. Candidates who are looking for the Postal Recruitment 2018 AP Can apply through indiapost.gov.in before the last date i.e 19th December 2017.Applications are invited by the respective appointing authorities as shown in the annexure ‘B’ against each post, from eligible candidates for the selection and engagement to the posts of Gramin Dak Sevaks under Andhra Pradesh Postal Circle as listed in the Annexure.